Located in Manhattan’s garment district, this 1930’s era, 100,000 square-foot manufacturing building has been restored and renovated for office use. Renovations and improvements include the installation of new windows and storefronts, elevators, lighting, bathrooms, wall finishes and building signage. 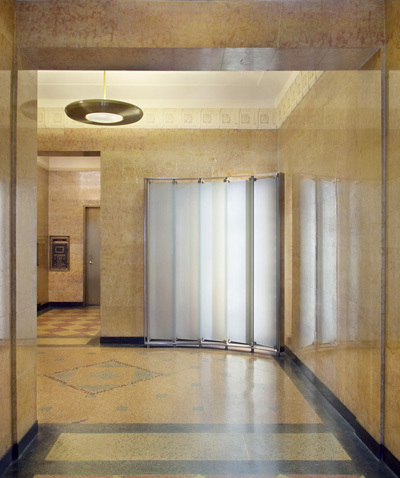 The building lobby, deteriorated by years of neglect and misuse, was carefully cleaned and restored to bring back the color and character of the original space. Stainless steel and translucent, backlit glass screens were added to enliven the space and to create reflective focal points when entering and leaving the building. Positioned to reflect light and movement around the corners of the lobby space, the segmented arc screens effectively create a welcoming and secure environment.